This topic describes how to configure the additional hardware on the physical appliance. It includes information on configuring the iDRAC management controller, and describes how to generate certificates and keys onboard the appliance using the Thales nShield Solo HSM. Log in using the default credentials, as specified in the following Dell documentation: Setup and Manage Your iDRAC. You can also access iDRAC using telnet, Secure Shell (SSH), and other supported network management protocols, such as Intelligent Platform Management Interface (IPMI). To change the network configuration of the iDRAC, for example to use a static IP address, see Configure the DELL Remote Access Controller. For further information on iDRAC, see the Integrated Dell Remote Access Controller (iDRAC) User's Guide on the Dell Support website. This section describes how to use the API Gateway Appliance with private keys stored on the Thales nShield Solo HSM. It describes how to generate and use private keys stored in the HSM's security world. Create a security world for the HSM. Generate a new private key on the HSM or Import an existing private key into the HSM. Import the private key into API Gateway. You must create a security world so the HSM can be used with API Gateway and other applications for cryptographic operations. Note The module must be in preinitialization mode. Set the module to preinitialization mode. Select initialization mode on the HSM card. Follow the on-screen instructions (you should have two blank cards to complete it). Note Do not create ACS for which K is equal to N, because you cannot replace such an ACS if even one card is lost or damaged. Set the module in operational mode. When a security world has been created, you can create and manage OCS and softcards, as well as create, import, and manage the keys it protects. For more information, see the Thales nShield Solo User Guide. This generates an RSA key with name key1 and size 2048. The key is added to the HSM key storage (/opt/nfast/kmdata/local/). The key1.pem file is generated, containing a specially encoded reference to the generated key. A certificate request and a self-signed certificate are also written to the key1_req.pem and key1_selfcert.pem files respectively. When you have the certificate and private key, you can import them into the API Gateway's certificate store to use for the CHIL engine cryptographic operations in API Gateway. Note You can also use the preinstalled KeySafe Java application to manage OCS, softcards, and keys using its GUI. You must configure it depending on your security environment (see the Thales nShield Solo User Guide). If you already have a set of software keys, you can import them into the HSM and instead use the private keys stored on the HSM for all supported cryptographic operations on API Gateway. DES, DES2 and Triple DES keys. Note Make sure the PEM pass phrase contains at least four characters. Now you have the key1.pem RSA private enveloped key stored on HSM that you can import into the API Gateway's certificate store. The key1.pem is not a real private key, but an enveloped key that references the real key protected by HSM. The key1.pem cannot be used for cryptographic operations in isolation, for example, when the HSM that protects the real key is not accessible, or the real key is removed from the HSM. You can import the certificate and private key stored in the HSM using Policy Studio (see the API Gateway Policy Developer Guide). For example, you have the HSM private enveloped key key1.pem and the self-signed certificate key1_selfcert.pem (see Generate a new private key on the HSM or Import an existing private key into the HSM). 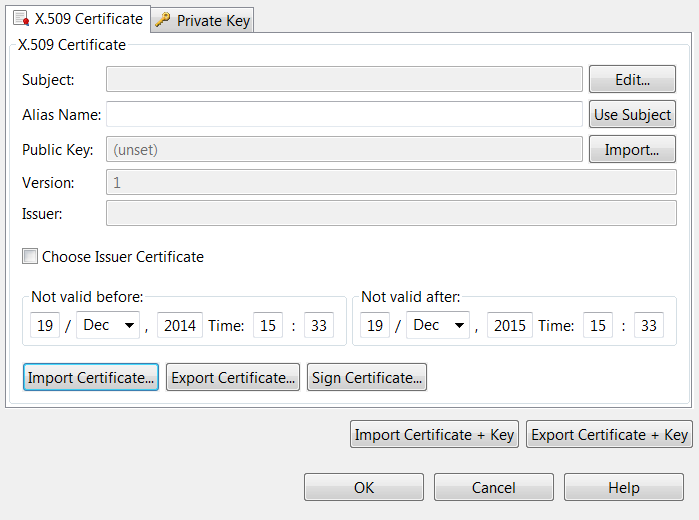 In the Policy Studio tree, select Environment Configuration > Certificates and Keys > Certificates. Click Create/Import at the bottom right of the window to open the Configure Certificate and Private Key dialog. Click Import Certificate on the X.509 Certificate tab, and select the key1_selfcert.pem file. Set the Subject field as required for the certificate. Click the Private Key tab. Select the Private key stored locally option. Click Import Private Key, and select the key1.pem file. Click OK in the password dialog, leaving the password field blank (key1.pem is not password protected). Note Do not select the option Private key stored on Hardware Security Module (HSM) for the Thales nShield Solo HSM. This option is required for HSMs from other vendors. Click OK to save the imported certificate and private key in the certificate store. Now the certificate store contains the certificate with the private enveloped key stored and protected in the security world of the nCipher nShield Solo HSM (/opt/nfast/kmdata/local/). You can use this certificate in filters that perform cryptographic operations with the OpenSSL CHIL engine. device name          #1 nFast PCI device, bus X, slot X.